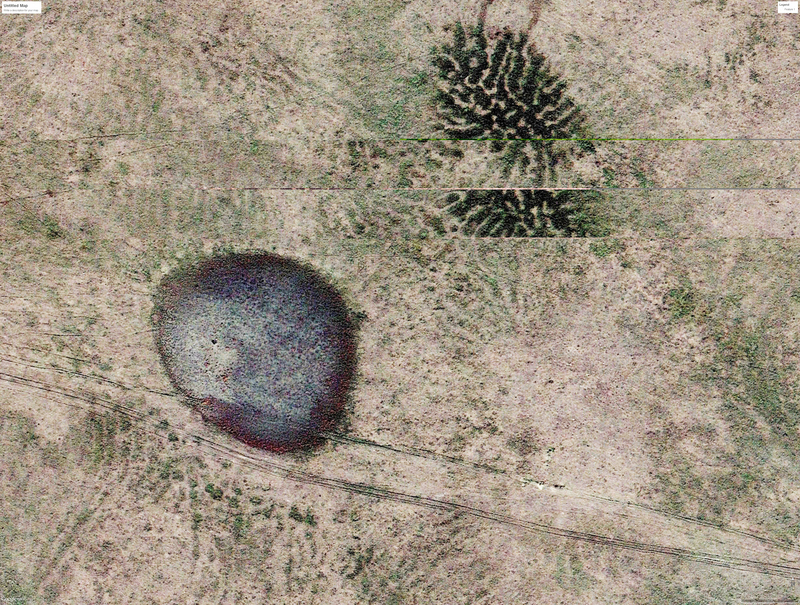 This image from Google Earth shows gilgai in the Panhandle of Nebraska; the field of view in the photo is approximately a quarter-mile wide. Two scientists with the University of Nebraska-Lincoln identified an unusual natural patterning of the land surface, called gilgai, for the first time in Nebraska. Matt Joeckel and Les Howard of the Conservation and Survey Division at the School of Natural Resources discovered the striking geologic pattern in the remote northern part of the Panhandle by examining high-resolution aerial photography in Google Earth. The find was published in the April 2018 issue of Great Plains Research. More than 300 occurrences of the phenomenon were recorded in Sioux and Dawes counties. The majority of these occurrences are linear gilgai, which are low (probably less than about 20 inches in height), parallel ridges with even spacing. Shallow troughs appear between the ridges. “Though gilgai has been known since about 1960, if not earlier, from large areas of western South Dakota, it appears that it was never identified—or, much less, characterized—in Nebraska before,” he added. The phenomenon has been identified in multiple states in the United States, but also in other countries, perhaps most famously Australia where the term “gilgai” originated; it means small watering hole. Gilgai is generally thought to form when clayey soils experience, over millennia, repetitive cycles of drying and wetting. Rainwater infiltrates deep soil cracks and causes swelling of the soil. The subsequent increase in soil volume at depth thrusts parts of the soil mass upward and sideway, forming a geometrically regular pattern of mounds or ridges, called microhighs, with shallow depressions or microlows at the land surface. Research has shown that gilgai can be obliterated, at least temporarily, by cultivation. “Our observations suggest that gilgai microrelief in the study area has been compromised by cattle tracks and soil erosion” Joeckel and Howard wrote in their study. “(It) was likely more prominent prior to intense grazing” and erosion due to human land use, but it can form again within years to decades. Gilgai contributes to the diversity of local and regional landscapes, with denser vegetation growing in the lows, and seasonal water basins forming in others. Gilgai influences land-surface hydrology and land use, and it can have negative impacts on roads and building foundations. Still the discovery calls for more research on the origins and ecological associations of gilgai in Nebraska. Researchers in other parts of the world have found different plant communities and the highs and lows of gilgaied landscapes, suggesting a key role in local and regional biodiversity. The Conservation and Survey Division is a multidisciplinary research, service and data-collection organization established by Nebraska state statute in 1921. The division also serves as the natural resource survey component of SNR.